We’ve had a free-range muscovy duck lurking in our freezer for the past few months. It was one of those things I was really excited to find for sale at Whole Foods, but once I got it home, I began to be terrified that I would screw it up and render $25 worth of meat inedible. But Jeremy started asking if I was ever going to cook it, and suggested Labor Day as the perfect occasion to do so. I plunged the thing in a cold water bath to thaw, and anxiously spent the day trying to decide how to tackle the meal. I ended up going with Ina Garten’s straightforward recipe for roast duck. Most duck recipes call for boiling or steaming the duck meat first, which I believe is to render out some of the fat and parcook the meat, so that it can be finished off in the oven over insanely high heat for a short period of time and still come out cooked inside and perfectly crisp outside (as opposed to sizzling burnt skin and rare meat, that is). For this recipe, you boil the whole duck in chicken stock for 45 minutes, weighting it to keep it from floating—this is a duck, after all; what else floats in water beside witches? Then you let it air-dry so the skin can really crisp up when you pop it in the 500F oven for half an hour. 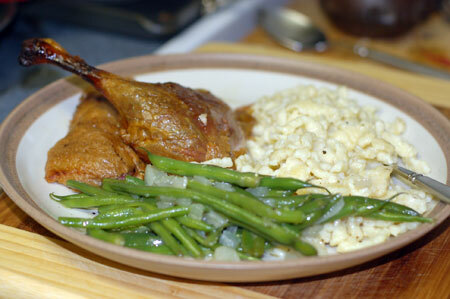 While the duck roasted away, I made some spaetzle and haricots verts with onion and lemon thyme to serve along with it. All the while, I tried to prepare Jeremy for the eventuality that the duck could end up like the turkey in Christmas Vacation, so dry it burst when Clark Griswold tried to carve it. But actually, it came out beautifully, just as intended: crispy skin and tender meat. Jeremy loved it. I’ve never had duck before, and I’m not so much a dark meat person, but I thought it was very good also. I can understand, though, why duck is so often paired with sweet, acidic fruit to cut all that richness. Next time, I guess! I saved all the duck fat I could, and boiled the carcass in the stock again after we were through with it, so I’ve got some duck stock in the fridge waiting for another use. Any suggestions? Unwrap the duck and allow it to sit at room temperature for 20 minutes. With a fork, prick the skin without piercing the meat. This will allow the fat to drain off while the duck cooks. Meanwhile, in a large, narrow stock pot which can just hold the duck, heat the chicken broth with 1 tablespoon of kosher salt until it boils. Add the duck very carefully and bring the stock back to a boil. If there isn’t enough stock to cover the duck, add the hottest tap water to cover. If the duck floats to the top, place a plate on top to keep it immersed. When the stock comes back to a boil, lower the heat and very gently simmer the duck in the stock for 45 minutes. When the duck is finished simmering, skim off enough duck fat from the top of the stock to pour a film on the bottom of a roasting pan. This will keep the duck from sticking when it roasts. Carefully lift the duck out of the stock, holding it over the pot to drain. Place it in the roasting pan, pat the skin dry with paper towels, and sprinkle with 1 teaspoon of salt and the pepper. 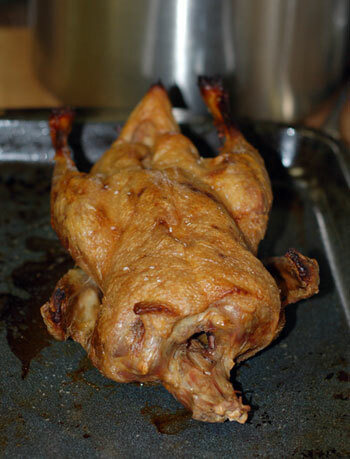 If you have time, allow the duck to sit at room temperature for 30 minutes to allow the skin to dry. Meanwhile, preheat the oven to 500 degrees F. (Be sure your oven is very clean or it will smoke!) Roast the duck for 30 minutes, draining (and reserving) any excess duck fat every 10 minutes. Make sure to move the duck a bit on the roasting pan to ensure it doesn’t stick. Remove from the oven and allow to rest, covered with aluminum foil, for 20 minutes. Serve warm. When you have removed all edible meat from the duck carcass, return the remains to the stock and simmer over low heat for several hours, then strain and refrigerate. Skim the congealed fat from the top of the stock, and reserve both for another use. Source: Adapted from Barefoot Contessa with Ina Garten. HAhaha! Oh my gosh, the title of this just kills me. Man, I would be terrified to cook a duck! Kudos on your bravery. It’s fascinating what we find intimidating, isn’t it? I just went to your website and saw those live crabs… those would be much more scary for me to cook than the duck was! We got some pre-cooked dungeness from the grocery store to roast once, and I could barely even touch it, much less break it down afterwards. Thank goodness for hubby!